The Annapurna Massif – part of the Himalaya range. Isn’t it strange how events come about in our lives? Is it happen stance or is it destiny? There is no doubt in my mind that it’s the latter. The seed which would grow into my visit to Nepal two years ago was planted as far back as the year of 1970 when my girl friend and I were back-packing around Europe. We kept running into other back- packers who were returning home to the US and Canada from India and Nepal. We were enamoured by their stories of Kathmandu and the vibrant scene of the ‘hippy’ life they had either experienced or witnessed there. It was a whole new world I had not even heard of opening up before my eyes. How naive I was! Fortunately or unfortunately, depending on how you look at it, we never got there since we were running out of money, or perhaps that was the excuse because down deep we were really afraid to test such unknown waters. When the same girl friend and I were having one of our yearly meet-ups at her house three years ago, the subject of us travelling together to India came up again for the umpteenth time. For me, that seed was obviously still there and about to germinate because I could feel the excitement bubbling up within me. It was time to make this journey! I was going to go even if I had to do it solo! Long ago my husband told me there was no way he was ever going to India. My friend was mildly interested and thought that adding on Nepal would be an extra bonus for her if she went. I agreed so began to incorporate that possibility into my travel plans. As it turned out, my friend took ill and never did accompany me. It simply wasn’t a part of her destiny as it was for me. I set off to fulfil my dream of travelling to both India and Nepal in just over a month. Thank you my dear friend for igniting the fire. You can read about my visit to India in my post entitled “Incredible India” and about Nepal in ” My Adventures in Nepal”. 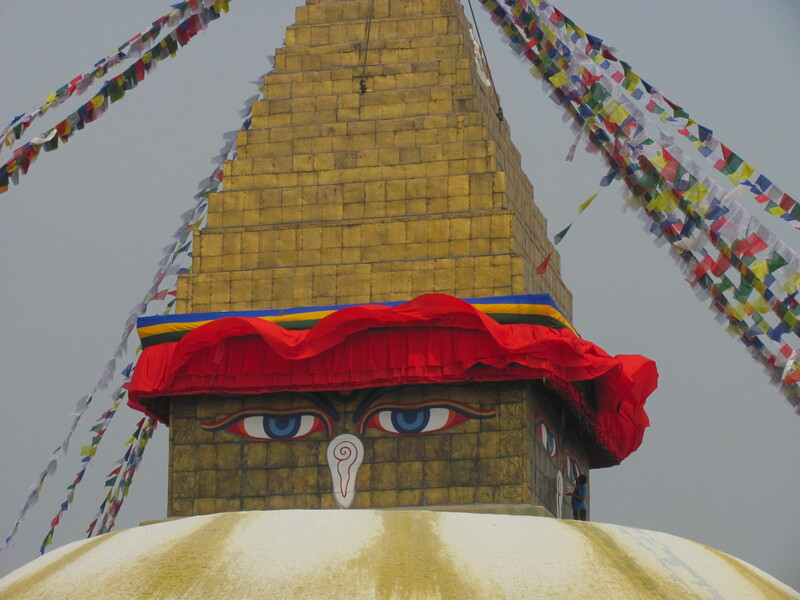 When I heard of the devastating earthquakes that hit Nepal in late April, I was doubly grateful for having had the privilege to visit this fascinating country when I did. On the other hand, I was so saddened to think about what this beautiful country with its abundance of temples and spirituality had lost. A quake of 7.8 magnitude followed by another at 7.3 seventeen days later has had a devastating effect on the country. Over 8,000 souls taken with thousands left homeless, many of their sacred temples toppled or shaken to their foundations, and an almost fatally wounded tourist industry has left the country reeling. Fortunately much relief has poured in from India, China and other wealthy countries, but with ongoing tremors, a traumatized populace, and a government with an unenviable record of instability and ineptitude, the recovery will be long and probably painful. According to the latest reports coming out of the country via the media the future is looking a bit brighter than originally anticipated. The government is at long last stepping up to the plate by focussing on raising funds for rebuilding. They are seriously taking the need to rebuild more responsibly something which should have been done years ago since they have been warned about huge earthquakes coming for over fifty years. Moreover, after much squabbling over a new constitution for democracy for the past ten years, they are now about to draw up a long-awaited new one. Yes, it often does take a disaster to get the ball rolling in the right direction. 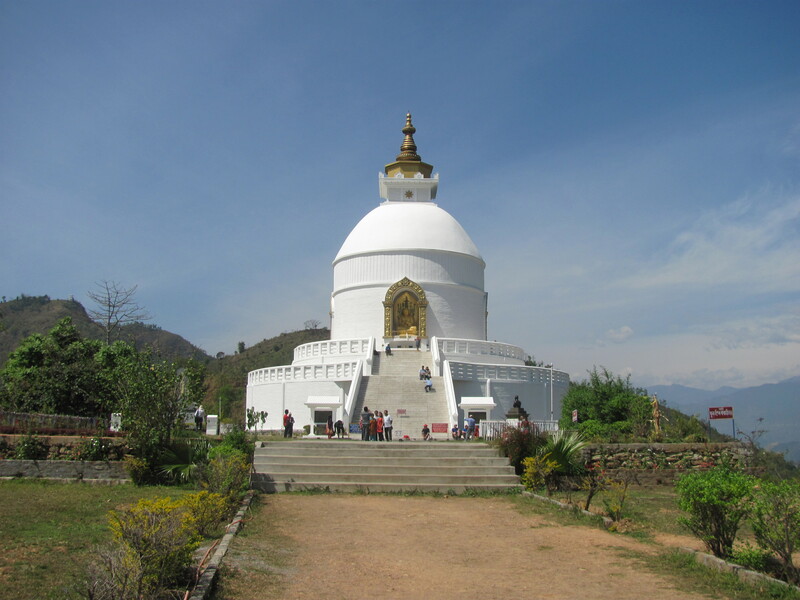 Tourism is a major industry for Nepal because of the Himalayan Mountains and the trekking that they offer, as well as the spiritual history of the country with its numerous designated heritage sites in the Kathmandu Valley. In fact, tourism provides 40 per cent of its gross national product. Needless to say, the government is anxious to lure the tourists back so have been working tirelessly to reconstruct the least damaged sites which fortunately happen to be those most visited, such as the main Durbar Squares in Kathmandu, Patan and Bhaktapur. There is some doubt that they are meeting the safety standards required so tourists are still being very cautious about returning. The latest report is that many of the sites are offering free WiFi so tourists can upload pictures to send to the rest of the world. Pretty clever marketing, I would say. To sweeten the pot, they have also commissioned many big name stars to come and put on performances to raise much-needed reconstruction money. In other areas of the country, many of the more remote villages are still reportedly cut off from the outside world. These would be the areas where total villages were wiped out. Another surprising bit of information passed on by the geologists and scientists who have been studying the effects of the quake on Mt. Everest is their discovery that it has actually shifted southward about 1.2 inches. Surprisingly, Pokorha, the second largest city in Nepal and one of the prettiest due to its location on Lake Phewa with the snow-capped peaks of the Annapurna Range towering over it, suffered no damage at all. However, it is suffering an almost total lack of tourists with a 95 per cent vacancy rate. At this time, Nepal is still feeling tremors around the country which isn’t doing much to help calm the Nepalese nerves. They are also having to deal with mud slides due to the heavy rains. However, this country has endured much discomfort over the years beginning with the abolishment of their monarchy, their subsequent search for stability and freedom from a patriarchal caste system, corruption, constant power outages, and the threat of earthquakes. Their spirits are strong which will stand them in good stead as they slowly move forward to resurrecting their country from this latest disaster. In fact, with a new constitution in place, a Prime Minister who appears to be taking a strong position of leading his country out of the aftermath, and through the generous contributions from around the world, Nepal will survive and tourists will once again be eager to return. The Royal Palace (now a museum) in Kathmandu. A saddista or spiritual man who owns nothing. A fair-trade market in Patan. Keeping the temple in good shape. A street in Bodnath – spiritual centre for Buddhists. Preparing for a cremation on the banks of the Bagmati River. The temples in Patan – Hindu and Buddhist. A Hindu temple in Patan. My first glimpse of the Himalayan Mtns. 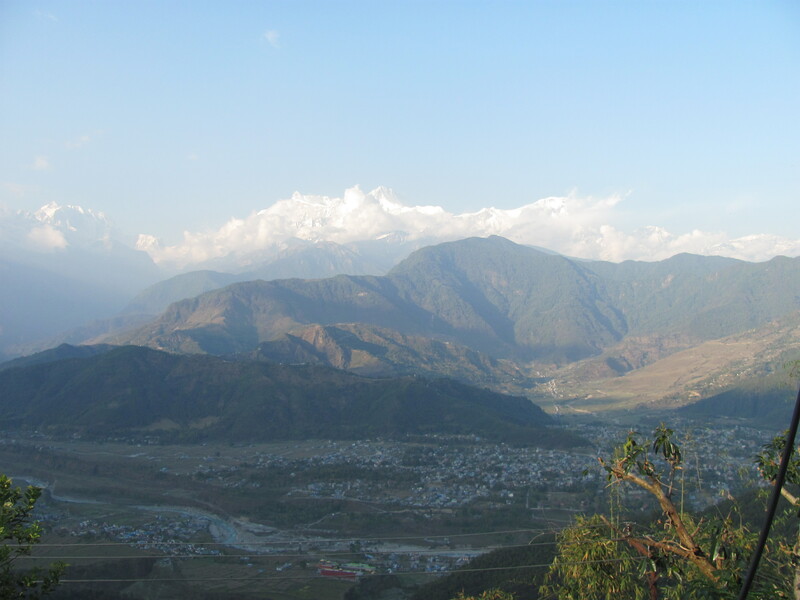 Overlooking the city of Pokhara. The tranquil Lake Phewa in Pokhara. Pokhara with its mountains and lake. On the way up to Mt. Sarangkot. Nearly to the top of Sarangkot. A fairly typical street in Pokhara. Nepal is similar to India yet somehow different. Shortly after my arrival, I noticed that the attitude of the men was distinctly different. Women travelling on their own are more accepted and can feel safer here than in India. Travel was definitely more relaxing. For example, men would always try to sell me something but quickly back off after a polite “no”. Women seemed to be more visible not so much in the shops, hotels, and restaurants as out in the streets with their babies and children. If they were in the public eye, they more than likely could be seen cleaning the hotels rather than working at less menial jobs. 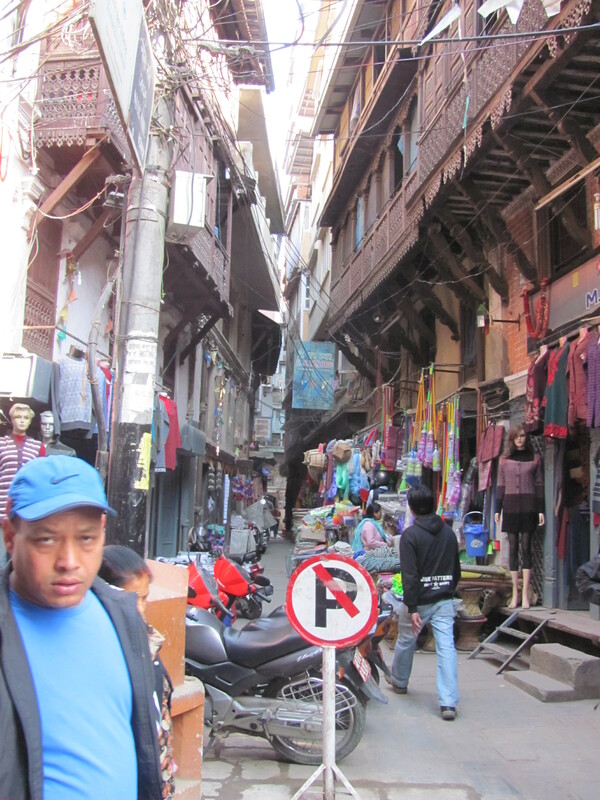 My first stop was Kathmandu, the capital made famous to the western world by the hippies in the ’60’s. Today one still sees some young backpackers who seem to delight in looking as dirty and grungy as possible, grooving around in their carefree lifestyle. Today most tourists are of all ages taking a quick look at the charm which still lingers in spite of the traffic congestion due to narrow streets lacking any kind of infrastructure making it extremely dangerous for pedestrians, and with that there is terrible pollution. They stay a couple of days and then escape to other hot spots such as Pokhara, Chitlan National Park, and the Himalayas. Trekking is by far, the biggest draw for visitors to Nepal. After two days in Kathmandu of sight-seeing which included numerous sacred Hindu and Buddhist temples and the famous Durbar Square where once the palace of the Royal family was located, I booked a flight with Buddha Air for Pokhara, Nepal’s second largest city, but because of its altitude can boast of a much cleaner and cooler climate. An interesting aside to a bit of historical background on this troubled country,which for so many years was closed to western visitors, is the plight of the Royal family and why their palace is now just a showcase of what it was in the past. In 2002 almost all of the Royals were massacred by one of their own members, a cousin who was reported to have gone insane with grief and despair after being denied marriage to his girlfriend from a lower caste, took his revenge by slaughtering all the members living in the palace before taking his own. Shortly after this atrocity, the monarchy was abolished. Apparently some of the family members who survived now live outside Kathmandu in a small bungalow leading a very quiet life. Pokhara has to have one of the prettiest settings in all of Asia nestled at the foot of the Annapurna Mountains, a part of the famous Himalayan range running throughout the whole country, and resting peacefully beside the beautiful Phewa Lake. 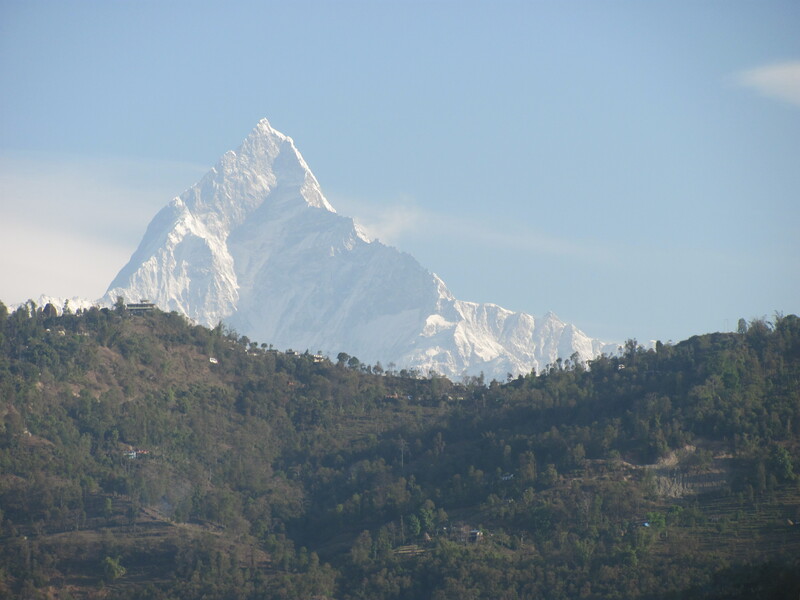 By coming here, I realized that I could say I saw the Himalayas even though I didn’t climb them! I was absolutely thrilled as I got my first glimpse of these majestic mountains from the plane. However, once I got there, I was quite disappointed to find they had all but disappeared the next morning in a cloud of haze which lasted for three days. I was beginning to despair that I would ever get to see them again until the third night when we were treated to a rain storm with high winds blowing all the haze away. By next morning when I woke up and looked out my hotel window, there was this breath-taking monstrous peak sticking up into a clear blue sky. Here is what I saw from my hotel. The gift of this beautiful day was just what I needed to motivate me to do some trekking, so I chose the World Peace Temple, another sight looming before me from my bedroom window, as my destination. I decided to do the trek up on my own since the path was straight up following some well-placed, hand-carved stepping-stones. It was arduous; however, I received some help from a nice Nepali lady who was looking to earn a few rupees for her efforts. I thought, ‘Why not’ because it was a win-win for both of us: I got some company and she got some much-needed money. After saying our ‘good byes’ using sign language, I enjoyed exploring the temple and the magnificent scenery, all the time thinking how wonderful it was to be experiencing all of this. My feelings of euphoria were short-lived. My troubles began when I couldn’t find the path I had taken to come up. Suddenly there were many paths to choose from, and no one had a clue about the one I was looking for. I felt pressured to start down because my time was running out. I had promised the boatman who brought me across the lake to access the short way up that I would be back at 1:30 p.m. After many false starts from both tourists and locals, I made a choice to take the recommended path that would take me around the lake meaning a 2km. hike. Before long, I met what looked like two large black cows coming towards me. I stepped away from their path giving them what I thought was ample room to get by me. The one with the big horns decided there wasn’t enough room for the two of us so before I could even gather my wits to get out of his domain, he ran full force into me knocking me down. All I remember was landing on all fours and swearing out loud ( I will not repeat what I said), but I was glad no one was around to see or hear. By the time I had recovered enough to get up, I noticed that both of them were racing up the stairs of the restaurant where I had a cold drink before heading down. They were out of control and probably very angry. The thought occurred to me that maybe it was the rusty, red shirt I was wearing that day that sent them on their rampage? I was beginning to feel an intense pain in my upper leg and abdomen where the two horns had hooked me, but thank goodness there was no blood! My 2km. walk seemed more like 10km by the time I got back to my hotel. I hobbled in and made some mention of why I was limping but received no sympathy from the guy behind the desk for he quickly changed the subject. Perhaps he didn’t want any word about my adventure getting out to any of the other guests for fear of scaring them off. Later I found out that other visitors had run-ins with some of the many cattle which roamed everywhere. Such is the price we pay for being a tourist in a country which really has not been open to the rest of the world as a popular tourist destination for very long. Another thing I learned was to steer well clear of any critter with horns. Needless to say, I spent lots of time crossing streets! Shortly after this mis-adventure, I met up with Cheryl and Neil from England, well-seasoned travellers that my husband and I met several years ago first in Laos and one year later quite by accident in Siem Reap, Cambodia. They made a special effort to meet up with me in Pokhara for which I was extremely grateful and ended up staying at the Silver Oaks Inn where I was staying which made it much easier to get together for meals and catch up with our travelling tales. 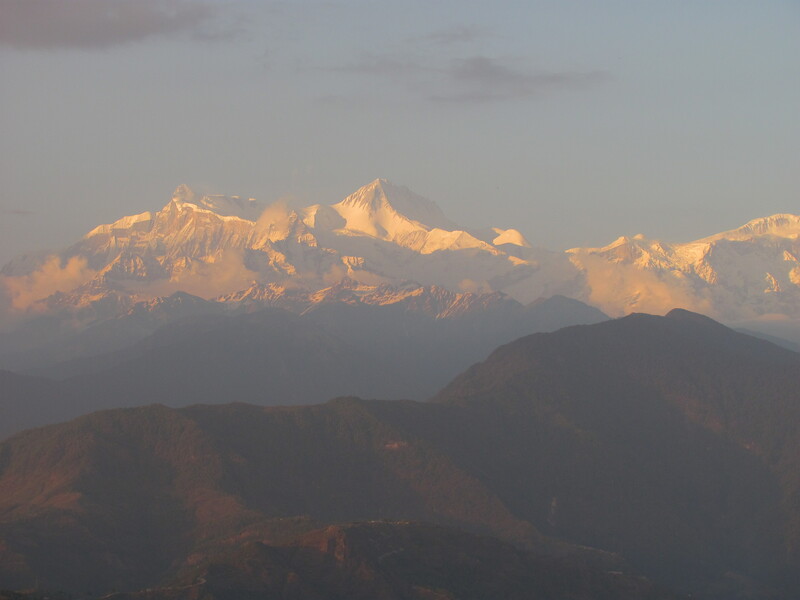 We also managed to do one more trek up Sarangkot Mountain to see the sunset. In spite of still feeling the effects of my bull incident, I realized it was all worth while when we got half way up. To see the whole range of mountains laid out in front of us at sunset is an unforgettable experience. I’m told the sunrise climb can be equally as glorious! I will save this for another trip which may be a possibility. Nepal is a good country to escape to in March when South East Asia is heating up. The climate while I was there in the latter part of March was cool nights and warm days. Although Nepal is known as a relatively wet country due to its mountainous terrain, March is probably one of its driest months. For the two weeks I was there, it rained a few times lasting just long enough to keep the air nice and clear. Trekking, from one-day treks to two weeks or more, is the main attraction, but for those who are looking for something more adventurous, there is paragliding and river rafting. Furthermore, I found there were numerous yoga and meditation classes throughout the city for those who want to get in touch with their spiritual side. Restaurants and hotels are abundant, many of which are doing a great job in spite of daily power outages. I was amazed at how the people coped with the hordes of tourists who are flocking there in spite of the short time the country has been open to having them, and the disadvantages they are under in serving them. To answer your question on whether I would consider going back, I have to say that ‘ yes’ I would if the opportunity presented itself. I found it to be a fairly easy country to travel in and so long as it stays politically stable it should continue to improve its infrastructure and tour services. It’s a beautiful country and has much to offer the rest of the world. I arrived at the Indira Gandhi International airport in March of 2013 where I was met by the driver of the guest house I had booked. Managing to clear customs, retrieve my luggage, and get some rupees without any hitch, I accompanied Sanjay, who spoke adequate English, to his car for my first exposure to New Delhi traffic. He was a master at maneuvering the nightmarish traffic but not without the constant use of his horn which I quickly discovered was common throughout this part of India. This is a common scene in Delhi with the hoards of people, animals, cyclists, motorbikes, trucks, and buses all out to fend for themselves. There weren’t any road rules, and if there were any, they were not being obeyed. I was just happy to reach the Hospitality Home B&B in one piece. My second shock was the entrance to this hotel which was located in a narrow alleyway with a very unappealing sign and a steep stairwell leading up to the five rooms. I began to suspect I had met my first Indian scam: the one where your cabby takes you to another place and receives a commission under the pretext that your place has been closed or burned down. Even the elderly man at the reception desk looked suspicious! It was a friendly English couple sitting nearby who temporarily dispelled any suspicions I had. To my delight, the rooms were everything I had seen on the booking site, and the odd-looking man was Mr. Sannai, the owner, who immediately put me at ease with a cup of his Indian tea. The English couple, Helen and David, couldn’t have been more welcoming. They were about to go out for a ‘bite to eat’ and afterwards to take a short tour of the city so invited me to come along with them. I had my first meal of delicious cucumber riata and chick pea roti. This had to be one of the main reasons for coming to India! When we had finished eating, Sanjay took us back into the city traffic pointing out various points of interest, such as the very imposing Gate of India, a memorial to all those who lost their lives in WWII, and the Birla Mandir, an important prayer site for Hindus, which Mahatma Gandhi often visited. We stopped to take a tour of Humayun’s Tomb. Humayun was a powerful Mogul who ruled in the 1500’s and his wife had this built to honour him. With the imposing red sandstone buildings and lovely gardens, it was really beautiful, and, thus, is said to have been an inspiration for the man who built the Taj Mahal. With the temperature being in the comfortable low 20’s creating a surprisingly beautiful glow from the setting sun, we decided to carry on to see the famous Lodi Gardens, another place where the people of Delhi can escape the city’s chaos. We saw many strange birds including some we could put names to such as, green parrots and cuckoos. Unfortunately, there were too many crows which I discovered were everywhere in India in far too many numbers. Although my first day in India was quite incredible, the next few were a series of ‘ ups and downs’ with the ‘downs’ outweighing the ‘ ups’ by far. I was quite ambivalent about making the trip up to Agra to see the Taj Mahal. Part of me questioned how could I come all the way to India and not see it, while the other part of me didn’t want to face the hoards of people and the transportation available for getting there. I had quickly dismissed the idea of using the train and flying I reckoned would be too expensive. Thus, when an opportunity presented itself at Hospitality Home,from an amicable young man who spoke perfect English, I began to rethink the idea of going. You only live once, I thought, so why not seize the day! I hastily decided to take his package deal with my own driver because the price was affordable, but the best thing was it would all be planned for me. I could be the lady of leisure or so I thought! An added bonus was another free tour of Delhi. There was still lots more to see and do, and I certainly didn’t relish the idea of braving this city on my own, not after all the horror stories I had heard. The downside to this freebie was the driver I got was not Sanjay as promised, but one whose only aim was to get a good tip. I had to do battle with him all the time just to get him to take me to the few places I still had left to see, rather than to the factories that made all those expensive Indian souvenirs where he would receive a commission. In the end, all the wrangling got me to see Gandhi’s tomb, the Red Fort from the outside, and the Qutab Minar, India’s largest Muslim minaret built-in 1100 A.D. Oh yes, and he did drop me off at a very good restaurant that served delicious food. My big learning from this trip was to be wary of Indian men who do nothing but lie to you to get as much money out of you as possible. This one certainly fit into this category! The next day, I was up early preparing to go to Agra with a different driver, thank goodness! Although this new one spoke very little English that I could understand, he was far more understanding and a very careful driver. The drive up took over six hours on roads that were sometimes good, but mostly bad. However, this drive gave me an opportunity to see the real India. Cattle were literally everywhere, tons of garbage and dust everywhere, and the horn honking never ceased. 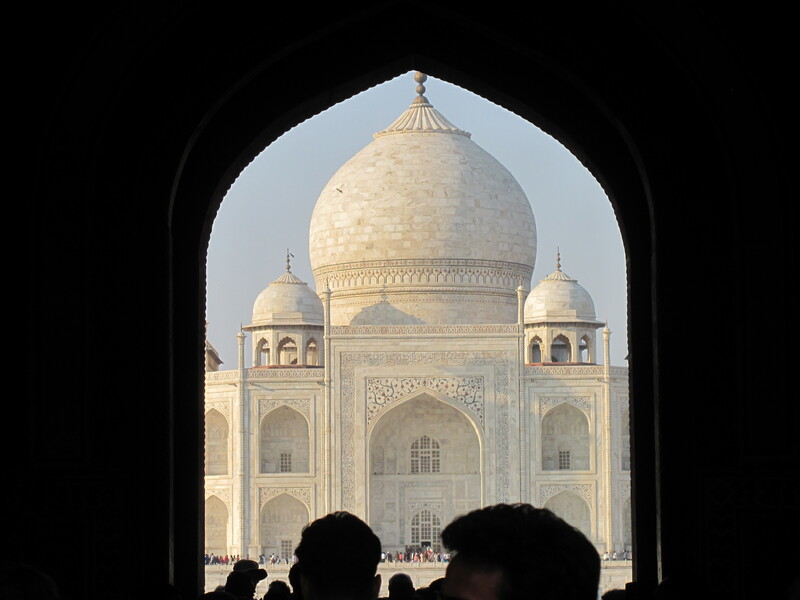 We arrived at the Taj late in the afternoon which is a good time to tour this famous tomb. The setting sun allows it to take on many subtle hues which, unfortunately, I could not get my camera to capture very well. My package tour came with my own guide who was there to meet me and to ward off the many touts who lie in wait for unsuspecting tourists. My first glimpse of this magnificent structure was literally breath-taking. I now knew why it’s said that when in India, you must make the effort to see it. It truly is one of the seven wonders of the world! The man responsible for this wonder was a Shah Jahan who built it as a memorial to his beloved wife who died giving birth to their 14th child. It was built with white marble imported from Europe and over 20,000 special artisans doing the carving and intricate inlay work. It took over 22 years to complete and had to be halted by the Shah’s son who threw his father into jail so he couldn’t spend any more money on it. He must have been worried about his inheritance! That night we continued to Rajasthan province arriving about midnight at the hotel I was to stay in just outside of Jaipur. Everything was just okay, not exceptional as I was led to believe. However, again I felt the pressure to tip everyone who dared to lift a hand whether I wanted them to or not. Next morning after an okay breakfast, it was nice to have my patient driver waiting outside for me. Drivers have to sleep and eat in separate quarters which are very basic. 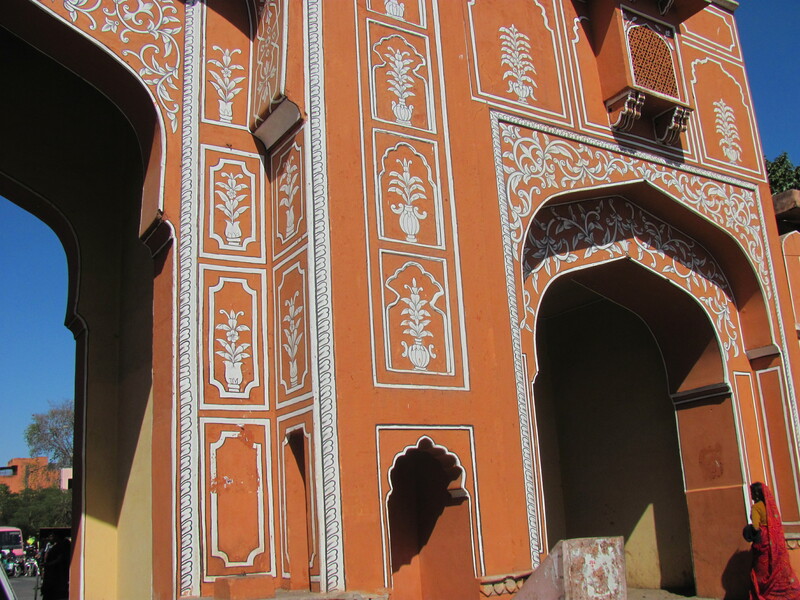 Our first stop was the beautiful Amber Fort which sat atop the mountain overlooking the town of Ambre. 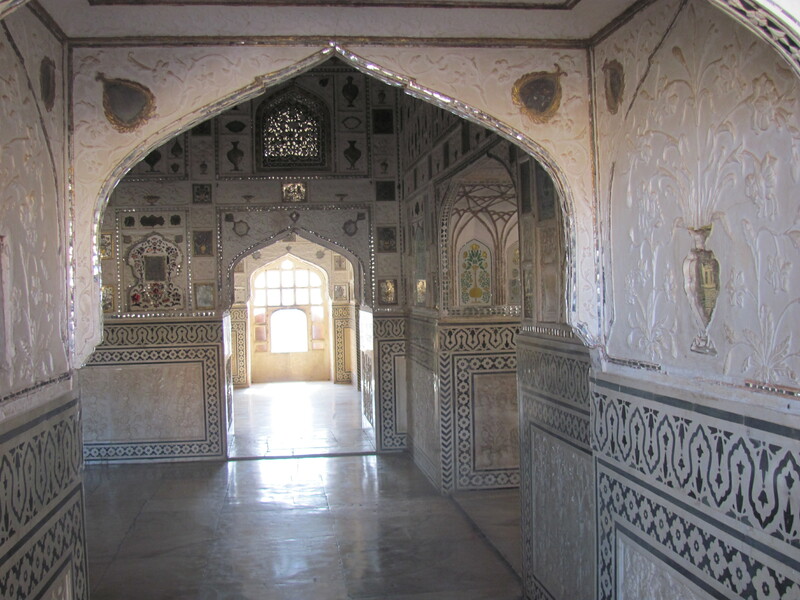 This fort is really a palace and, to my mind, almost as lovely as the Taj for its decorative inlay work. I was then taken into the city of Jaipur commonly known as ‘the pink city’. To commemorate the Prince of Wales’ visit in 1876, the maharaja had all the buildings painted pink, a task all home and shop owners still have to do to this day, as the old part of the city has been declared a UNESCO site. I would have liked to have seen more of this city, but I started to worry about how long it would take us to get back to Delhi having had conflicting answers to my question of anywhere from three to eight hours. That’s the Indian way – to never give a straight answer. In case it was the latter, I wanted to start back mid afternoon because my flight out to Kerala was early the next morning. Thank goodness, my driver could accept ‘no’ as an answer to his question of whether I wanted to do some shopping. After his third half-hearted attempt, we set out for what looked initially like an enjoyable ride. The trip back which was a different route from the one we took to go up, started off as a newly paved double lane highway, but after about 50km., it very quickly disintegrated so badly that as we got nearer to Delhi, we were driving on what appeared to be a single lane cow path. If you can picture this scene with huge trucks everywhere pushing and shoving their way through scores of tractors, auto rickshaws, motorbikes, sometimes with the whole family on board, along with cars coming from all angles, then you have an idea of the chaos that surrounded us. Then there were the fumes, the dust, and the incessant horn honking to top it all off! This horrific trip ended around midnight when we pulled up at Hospitality Home. By this time, I was experiencing the beginnings of a very sore throat and headache. However, the upside to all of this was a strong admiration for my driver who never once hinted at getting a tip and showed such patience and dexterity in getting us through this ordeal. If he had to do this all the time to put food on his family’s plate, then he deserved a really good tip which he got with no questions asked. My faith in the Northern Indian man had been restored. 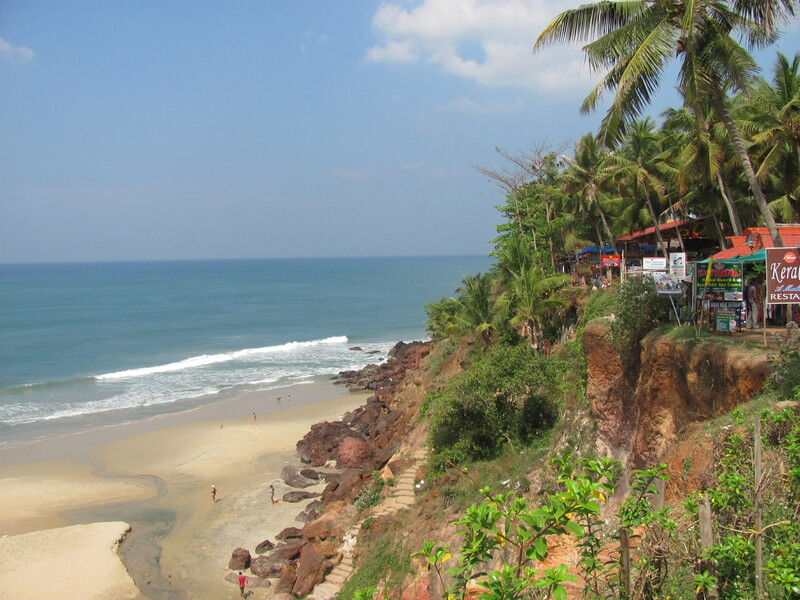 By the time I arrived in Varkala in Kerala state, I was definitely not in good shape and more than ready for the Ayurvedic treatments I had booked at Casa Eva Luna, the guest house where I was staying. In fact, Kerala is well-known for this ancient method of achieving wellness which was one of the reasons why I chose to fly all the way down there. One of the hostesses, Katrina, immediately booked an appointment for me with the Ayurvedic doctor who came the next day. She prescribed an herbal concoction along with some herbal pills followed by two wonderful oil massages. By day four, my cold/flu had almost disappeared. She put me on a diet of no dairy, eggs, or bananas which was difficult to stick to, but with the help of the two lovely hostesses at Casa Luna, we made it work. My entire stay in Varkala, a beach community at the very southern end of India, was a totally different experience from that of the north. It was relaxing, not only because of the Ayurveda treatments, but also because it’s like a separate country from Northern India as I mentioned in the beginning. The people are not only better educated and, therefore, better off financially, they are also more laid back and not so concerned about getting the tourists’ money. To sum up, it is just much easier to live there resulting in more travellers from Europe, the United States, and Canada coming to spend winters there. It has lovely beaches and scenery, and a colourful culture making for an abundance of festivals to celebrate the many gods and goddesses sacred to the Hindu religion. Every celebration has elegantly dressed elephants, delicious food, and lots of loud music which I was able to witness in a nearby town. One downside to Kerala is it has a very hot, humid climate with a short window for a time when it’s more bearable. I’ve been told that December and January are the best months. I was there in March when already it was heating up with temperatures in the low 40’s. Even the sea water was almost like a hot bath so not very enticing if you like to swim to be refreshed from the oppressive heat. Would I ever consider going back to India? Yes, I would because the first trip is always the most difficult. In retrospect, I believe that if I could do it on my own the first time, then the second time would just be easier since I’ve learned so much about this incredible country. I know I would definitely like to see more of the south such as the tea plantations in the hills, the northern part of Kerala around Cochin, the capital, the jumping off point for seeing the system of canals that run through Kerala, and then there is the far north in Kashmir which is supposed to be a real experience. Yes, India is a very diverse country with something for everyone if one is able to deal with it.